Another school year has started in Belgium and although a teacher by profession, I did not return to my class room, just like the previous 11 years. Yes, it really has been that long since I “left” my home country. Instead, Mark and I planned to finally leave Tahiti and sail to Moorea, the gorgeous looking island that had been in our peripheral vision for months. 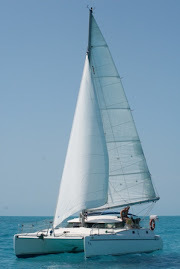 Irie had not shaken her sails out in five months, and we were ready for a change of scenery and new adventures. While I was enjoying a rare Skype call with my best cruising friend Rosie at 9am, Mark prepped the boat. When he was about to center the boom (we tie it off to the side of the boat, so it can be secured tighter and doesn’t obstruct the solar panels), he saw the traveler line was burnt through! Another mystery, but I have a sneaking suspicion this has to do with our grill being above the coiled line, or the portable generator fumes possibly “blasting” the line, even though the line, the grill and the generator have been in the same place for seven years, and this has never happened before! But, without one of the traveler lines, no possibility of using the mainsail (= no sailing)… so we had to solve the problem as soon as possible, especially if we wanted to leave before noon, the cut-off departure for our 4-5 hour Moorea trip. We pulled the pieces of line out of the track, packed up, lowered the dinghy and drove to shore. Then, we hitched to Pape’ete in the blazing sun, managing these 4 miles in two rides, one with a strange Frenchman and another with a friendly tourist from Hong Kong. Once in the capital, we mentioned that we were actually going much further, to the Punaauia district, where Michel’s marine store would have the line we needed. Mark and I opted to travel further away with this knowledge, instead of walking miles and rummaging through the city’s different marine stores in the hope of finding what we wanted. The Asian lady called up a local friend who would be on her way to the Carrefour in Punaauia, and we were “very lucky” she had not left town yet. We switched cars in the middle of traffic and had a comfortable air-conditioned ride to Tahiti’s best supermarket, from where it was a ten minute walk to Tahiti Yacht Accessiores in the Marina Taina area. The store was open, Michel was there (two for two! ), but… somebody had just bought two full spools of 8mm line. The only thing left was some brown rope on another spool. We needed 2X13 meters (so our two traveler lines would match); he said he had half of that if we were lucky! Did we want to know the length he had available? Of course… So, he unfurled the spool and counted exactly 26 meters! That was that for the 8mm line in Tahiti Yacht Accessiore, but we were pleased with this coincidence, even though it meant that Irie had a bronze traveler line instead of a speckled white one. We paid the man and – with our bounty packed away – stuck our thumbs out again for the return trip to the Tahiti Yacht Club in Arue. After a few minutes, a Polynesian father stopped and was incredibly helpful and generous by bringing us all the way home to our dinghy! We had managed to cover the distance and do our shopping in one hour and a half. Amazing! At 11:30am it took us a while to get the whole length of our chain up and out of the mud in the 60+ foot deep Arue anchorage, but before noon, we were happily sailing towards Moorea. One hour later, the wind turned more east – dead behind us - and we had to furl the jib back in, still doing a nice 5.5 knots with mainsail only. Another hour later, the wind turned SW, so we changed the sails from a downwind setting to heading upwind and close hauled. Then, it died totally (wind shadow of Tahiti? ), the sails luffed and Irie was stalled on a very choppy, confused sea. The channel between Tahiti and Moorea is known to be incredibly bumpy. Next, the direction of the wind was west, dead ahead of us. There were no squalls and the prediction had been SE. We have given up trying to understand the weather patterns in the Pacific. Instead, we grumbled and motored the last 2 hours in light head winds to our current anchorage near Cook’s Bay, behind the outer reef. The anchor was down and inspected by 5pm, when one of us had a glass of wine and the other a cup of water. We are very happy to be in clear, shallow water again, with a Moorea view worthy of being gazed at! ... and Moorea ahead, across the choppy "channel"
Moorea – A Hiker’s Paradise! Liebster Award Nomination for “It’s Irie”!